Here you can enjoy your retire in a contemporary luxury house with infinity pool where you can watch in awe the spectacular sweeping views along the coast to Manuel Antonio and spot the many species of tropical birds soaring in the updrafts over the densely forested mountains rising up from the beach. This new built home has all the comforts you would expect of a modern home and is ideally situated on a mountain ridge that enjoys cool breezes and gives you the privacy of your own space. The southern Pacific coastline has many beautiful beaches to choose from the closest to Casa Tangaroa is Dominical which is only a short twelve minute drive. If you want to take a dip in Mountain River there are a number of stunning local waterfalls with natural swimming pools to cool off in. This property gives you the freedom of outdoor living with the outdoor poolside breakfast bar under cover of the rancho with a barbeque, granite countertop and his and hers sinks. Perfect to enjoy breakfasts, lunch or dinners around the pool. Or tan poolside with your book listening to the sounds of the jungle. Located 1000 feet above sea level in the mountains of Langunas. 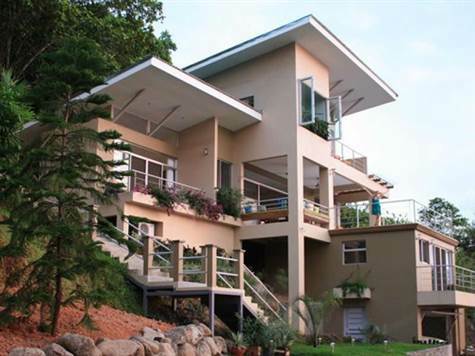 Casa Tangaroa is a light and spacious house fitted out in exquisite taste all four bedrooms have comfortable queen size beds, air-conditioners, ceiling fans en-suite marble bathrooms with modern fittings that all harmonize with the décor. The kitchen is built to the standards of a professional chef and fitted with marble countertops and all the latest modern appliances and utensils. The kitchen is open plan and is connected to the spacious lounge. Here you can relax in the deep and comfortable leather sofas and enjoy the view through the fully glazed floor to ceiling windows over looking the coastline. Casa Tangaroa is tastefully decorated with stylish collection of wall hangings, art and elegant touches that gives this house a very harmonious and relaxed ambience. The main house has three bedrooms and there is also a separate studio flat close to pool that is ideal for a couple or teenagers that what their own space. This is an house when you can enjoy luxury right in the jungle!